[Penn State alcohol researcher Caitlin Abar] studied how parents deal with their high school teenagers regarding alcohol use while still at home, and she then checked after the teens' first semester of college. Her study of 300 teenagers and their parents was published recently in the journal Addictive Behaviors. "Parents who disapproved completely of underage alcohol use tended to have students who engaged in less drinking, less binge drinking, once in college," Abar says. But, it was parents' rules that had the strongest effect, says Abar. Complete disapproval of teen drinking by parents was the most protective, even more than when parents allowed a limited amount of alcohol consumption. Research studies by Wood, Abar and others challenge the common parenting practice in much of Europe where kids are socialized to drink at the family table, with the expectation that they'll learn to drink responsibly. Dutch researcher Haske van der Vorst has studied this "European drinking model." Unfortunately, she says, based on her research, the European drinking model isn't working. "Not at all actually," she says. "The more teenagers drink at home, the more they will drink at other places, and the higher the risk for problematic alcohol use three years later." All of this is very important, because brain researchers have found that alcohol has a profound effect on the young, developing brain--and "young" means people up to 25 years old. Even fairly modest drinking can affect thinking and memory. I don't have kids, but most of my friends do, and we have all been pretty convinced by the European way. We regularly enjoy beer in the kids' presence, sometimes at pubs. This research makes me question whether this is a good idea. There are societal implications as well. I've long felt that well-lit family brewpubs were healthy not only for communities (I see no reason to doubt that), but for children who see responsible behavior modeled there. If you buy into the European school, family brewpubs are not only fun places to visit, but they're also useful in reducing addictive and dangerous behaviors. But if the European model is hogwash, as these studies suggest, the very idea of the family pub is thrown into question. This is going to provoke some deep thinking on the subject. Probably not good to make rash decisions, but it would be worse to ignore these findings--especially those of you with kids. Your thoughts? Upon further reflection. It's worth adding one comment here. There's no reason to doubt the results of these findings in the aggregate. But parents need to use their judgment when working with real live individual kids. As Sally and I were talking, it occurred to me that the reason I've always found the European model so persuasive is that the "zero tolerance" policy would have definitely driven me straight to the bottle. I have a goat-like character flaw that resists "zero tolerance" anything. But apparently, I'm not typical. Your kid may not be, either. Both bi-coastal Times (NY & LA) ran stories about the beer scene in Portland in their print editions. Online polls or no, we definitely have poll position on beeriest city. It doesn't hurt that we call the town "Beervana." Good branding. If the Tugboat stepped up and brewed Beervana-worthy beers, it would be in a fantastic position to start making money hand over fist. 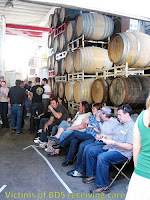 As it is, every article that discusses the Portland beer scene mentions Tugboat--one of only two downtown breweries. Christian Ettinger is not Elvis. He's a member of the second wave--way too young to be the King (though he has the sideburns). I'd have called him Colin Meloy. I give the Elvis nod to John Harris. In a study by The Netherlands' Maastricht University, researchers looked at nearly 15,000 people to see if they could correlate rainy weather and depression. They could not. And it's not just clinical depression. They couldn't even find a correlation between weather and mood. In fact, the highest rates of sadness occurred in the summer and fall. GMAC Insurance released the results of GMAC National Drivers Test, which tests driver knowledge of laws. Oregon ranks second behind Kansas. We got more than 80% correct on the test, along with only three other states. Although I don't immediately see a way to link these two findings to beer, I suspect the link is there nonetheless. Has to be. There are a lot of ways to sell beer in this state, but the easiest is to make them big and hoppy. It helps if you're conveniently located in East Portland--though Eugene seems like a pretty good location, too. A sure-fire business model includes a pub/taproom and capacity to distribute 22-ounce bottles and/or kegs to alehouses around the Northwest. Do that and your road is lined with rose petals. Ted Sobel, master of the all-cask Brewers Union Local 180, has not chosen the easy way. He makes small beers with low levels of hops. His pub is three hours from Portland, in Oakridge. 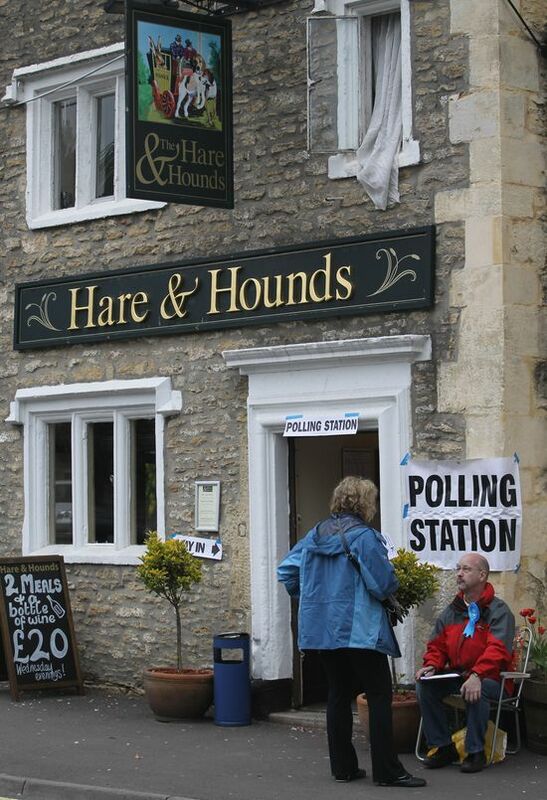 He brews real ale, sold exclusively by firkin, and only really trusts one other pub to handle his beer. To reach the Portland market, he must load the casks into the back of his station wagon and drive them up himself. For his trouble, he earns less per firkin than he would if he sold the beer in his own pub. In the term of art, Ted has not yet figured out how to "monetize" his vision in the way other pubs have. His road is thorny, cold, and lonely. Last night, Ted brought two classic cask offerings to the Green Dragon--Cwrw Welsh Mild and a classic English porter. Or, as he describes them, "plain, ordinary, mundane session beer." Actually, the porter was of a kind that is directly in most Portlanders' wheelhouse. It was smooth, roasty, and lively. Cask ale isn't innately a better form of beer, and there is honest disagreement over the method. But even non-cask drinkers would have gobbled this one down--maybe without even realizing it was casked. The mild, not so much. Ted used a tiny amount of peated malt, but a tiny amount's enough--it imparted a smoky, slightly sour note. Cwrw was creamy and soft--Sally called it "milky" and wondered if there was lactose ("no," said Ted)--and clearly low-alcohol. This is where I think Ted has his biggest hurdle. Craft beer drinkers have become accustomed to that sharp, anesthetizing tingle on their tongue. 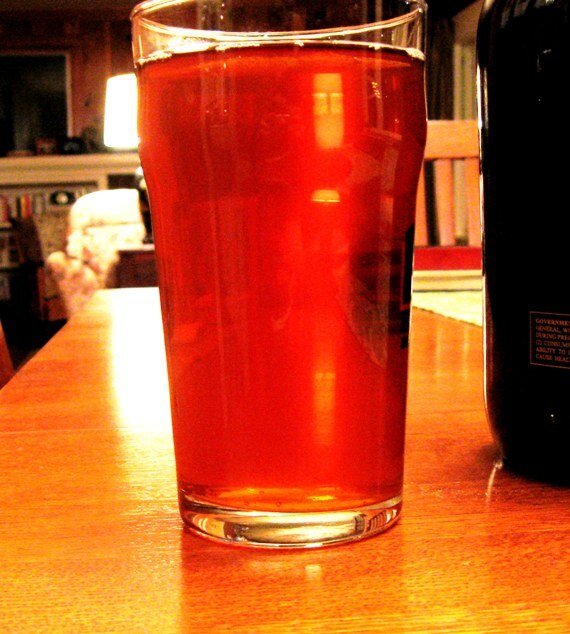 The difference between a mild and a stronger beer is the difference between apple juice and hard cider. To absent that quality from a beer is, I'm afraid, to move into a radical philosophical space that questions the nature of the drink. At least for most people. The mild had all kinds of flavors going on--but no amount of appreciating can will the flavor of alcohol into being. Can people put aside their expectations and appreciate the flavors that are in a beer rather than focusing on the ones that aren't? That's the big question. As for "Cwrw" (pronounced kuru, with a roll of the "r"), I think you'll find adequate clarification here. If you missed these beers, stop by Belmont Station this afternoon to try a special bitter called "Quid Hoc Sibi Vult?" 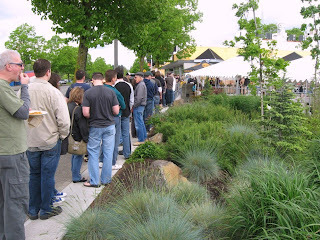 Pours start at three and run until the firkin's gone. My high school Latin's a bit rough, but the Google tells me this idiomatic expression is generally translated as "what does this mean?" I suppose we could read this as a question Ted ponders, elbow on knee, about the difficulty of the path he's chosen. (Or which has now chosen him.) A less idiomatic translation, apparently, is "what does this want for itself?" I like this one better. 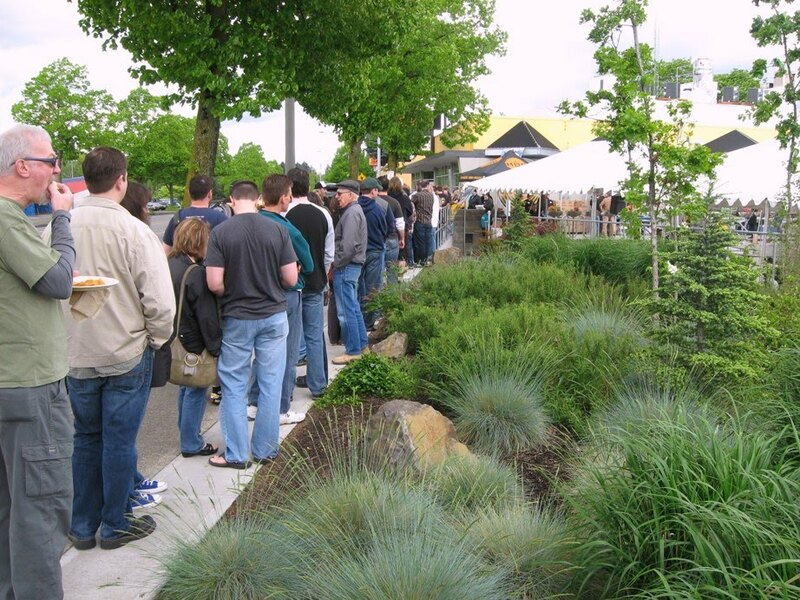 What does Oregon real ale want for itself? Appreciation, clearly. Ted told me last night that he expects there to be ten cask houses in Portland in ten years. This is what the real ale wants. I hope you're right, Ted. The cultivation of gourmands is a common goal for the outfits, which put a premium on education. Belmont Station (4500 Southeast Stark Street; 503-232-8538; belmont-station.com) in Portland, Ore., which stocks more than 1,200 different beers alongside a 26-seat taproom, offers one or two free tastings a week. “Over the course of the year you can taste well better than 500 bottled beers,” said Carl Singmaster, the owner. 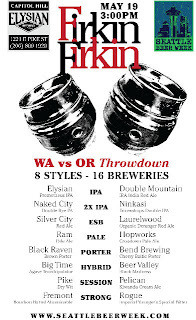 I was asked to do a flight of beers from Portland breweries, so I chose six, well-respected beers that highlight the full range of the city’s offerings: Upright Brewing's Gose, Hopworks IPA, Laurelwood’s Portland Roast Espresso Stout, Cascade Apricot Ale, Hair of the Dog Adam, and Full Sail Top Sail. You know what came next, right? I couldn’t have misread my audience more. 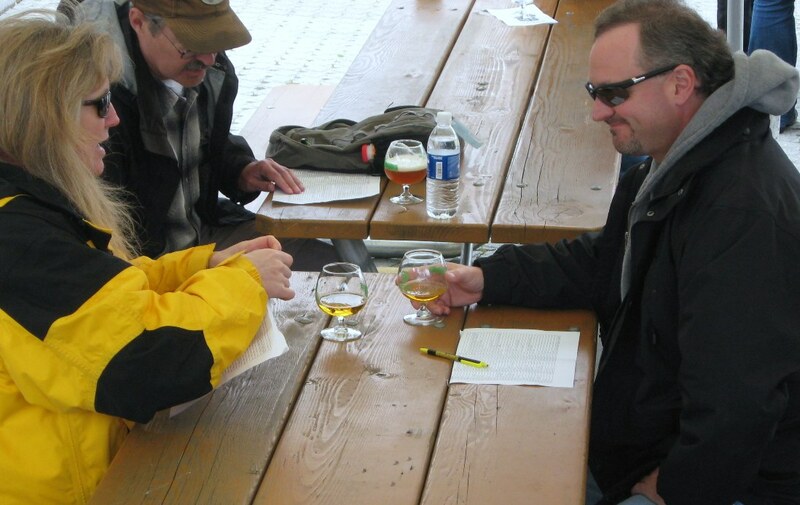 While these folks appreciated the unique flavors—their favorite word to describe the beers was “curious”—they were quick to say that they didn’t really enjoy any of the beers. Ben reflects on a bunch of possibilities about why things went sideways, but he gets it exactly right with this comment: "This tasting’s failure to impress makes me question that approach and burst my beer geek bubble." We do live in a bubble. And by "we" I mean humans. We tend to associate with people who share our values, interests, and backgrounds. The result is a misleading feedback loop that our views are mainstream. This isn't quite as obvious in the beer world, but in the other world I inhabit--politics--the truth is stark. Pollsters periodically ask people not only about their views, but about whether they believe others share their views--almost uniformly people do. Since everyone around us shares our views, we assume the rest of the country does, too. Classic sample bias. With beer, what has happened to us is that our views have gradually changed, but since all the people we know are changing, too, we don't notice it. Another example. When I was in grad school, there was this wonderful professor of Indian religions named David Knipe. He was an American-born scholar, but had been studying Hinduism for over forty years and spent half his time in India. By increments, as his understanding of Indian religion deepened, he began to forget what it was like not to know. Concepts like karma and reincarnation became so natural they were like water to a fish. Because he was the resident India expert, the school asked him to teach an introductory religions course, but he was terrible at it. Eighteen-year-old farm kids from Fon du Lac sat with their mouths literally gaping while he spoke. He might have been lecturing in Telugu for all they knew. Beer geeks in the Pacific Northwest suffer from this problem--call it Beervana Derangement Syndrome (BDS). We forget what it was like when Heineken was a challenging beer. When we think of "beer," the range goes all the way to Pliny the Younger and Boon Gueuze, but doesn't include Hamm's. When we think of a mild, approachable beer, we think of a light saison. Only under the influence of BDS could a person think of introducing a travel writer to beer via Upright Gose. The truth, of course, is that less than five percent of the beer sold is craft beer. Soured ales and imperial IPAs? So little of these beers are sold that, statistically, they don't exist. We might as well be talking about quarks for all the rest of the world is concerned. In the bell curve of beer, we're so far out in the tail that most charts don't even go that far. Ben probably should have chosen a list that went from the familiar and then took people gradually into the deep end of the pool. Something like Session --> Widmer Hefeweizen --> Black Butte Porter --> BridgePort IPA, and finishing up with the big shocker --> Hair of the Dog Adam. Next time. On the other hand, there are a lot worse ailments the Beervana Derangement Syndrome. We suffer from a kind of zymurgic dysphasia, but it doesn't affect our lives unless we encounter outsiders. Even then, the worst symptoms are confusion, disbelief, and pity. Oh, and the medication is amazing. Honest Pint Certifiers in Oklahoma City! I haven't gotten any info from Cris and Cheryl to update the webpage, but I'll see if I can track them down. What a way to start the morning--watching a video of people sporting honest pint tees! I suppose it's time for summer beers to hit the shelves--though we seem to be damned far from any actual summer round these parts. The weather in Puddletown these days calls still calls for porter. But, since breweries have been sending me bottles of their various seasonals, I might as well do a post for those of you living elsewhere. When the old devil sun starts a beating down on your head, the last thing you want is anything heavy. This much is true. Traveling through some very hot places, I have found refuge in very light beers. Some, like Panama's Soberana, are a real joy when you're at the edge of a jungle. (Beer Advocate raters, mostly not on the edge of a jungle, are unpersuaded.) In the summer, flavors, like sound, tend to get louder. What tastes like water in January may taste heavy and dangerous in July. So mostly breweries play it cool--light bodied beers, low alcohol, low hops, just enough of everything to keep the tongue occupied. Been a while since I've had a Pyramid Hef, but I was convinced to give it a revisit when the cans came out. In my memory, this has always been a bit closer to the German original than to Widmer's "hefeweizen," and so it remains. There are not a lot of phenols, but I get a distinctive bubble gum note, suggestive of isoamyl. Not a lot else is going on, though. The beer's cloudy but not super wheaty. It's light, but not terribly crisp and ends with a bit of a thin, wet note. Imagine the result of combining a kolsch with a German hefeweizen. I love German hefes, and the funkier they are, the more I love them. Somehow, the initial aroma of the source style with the ultimate failure to deliver disappoints me. Either give me the full monty or give me a straightforward American wheat. Call it a gentleman's C.
There are FAR too few pilsners in Beervana. 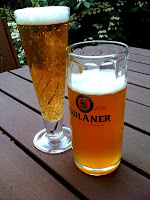 I don't mean one-off pilsnery light lagers, I mean lush, crisp, Saaz-drenched pilsners, one of the world's finest pours. In Rope Swing we have what pencils out to be a perfect remedy: a 5.3% Saaz-hopped pils of a respectable 25 IBUs. How can this go wrong? I don't know, but it has. I just don't like this beer. There's something very unpleasant about the hops, which give a weedy, grassy bitterness wholly unlike all the other tangy Saaz-hopped pilsners I've tasted. It's a over-thin and lacks malt character. I tried one bottle with friends and to a person they all thought it was nice--including an avowed pils-hater. Later, Sally gave it an "eh," but was surprised at the vehemence of my antipathy. Not for me. What is it with weird names? Sunburn's not as bad as "Grifter," but it still seems an odd choice: why do breweries select nouns with negative connotations for the names of their beers? A mystery. Like the other beers, this is definitely a traditional summer seasonal--light, pale, and mild. 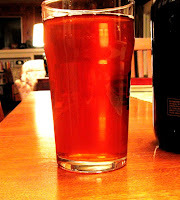 But give the Widmers credit; for such an underpowered ale, it performed well in our taste tests. It's a mere 4.3% (10 P!) and either 15 or 20 IBUs (sources vary), but those few hops are well-used. The Brothers (or Joe Casey or Ben Dobler or ...) dry-hop it with Citras, and this is indeed a good move. Dry-hopping adds flavor and aroma but no bitterness, and so Sunburn gets extra juice without actually employing extra juice. That's how you do a summer beer. And in fact, 20 IBUs in a 4.3% beer ain't too shabby. This is a winner, and you don't even have to be near a jungle. Oh great, as we come down to the wire, Portland and Asheville are just about tied again in the pernicious "BeerCity USA" poll. I'm beginning to think my influence is not all that: didn't I tell you to vote for San Francisco? At this point, San Diego, the third-place city at 5.5%, may be the way to go. Portland now trails Asheville by just .6%. Update, 6:36 pm: Portland 34.4, Asheville 34.5. Aiiiieeee! Update, 12:12 am: Portland 35.2%, Asheville, 34.2%. Ah, what the hell, I've just been to a beer dinner at Wildwood, featuring Pelican beers. We are the best. Say it loud, say it proud! Update, 10:00 am, Saturday: Portland 34.9%, Asheville 35.3%. Update, 12:37 pm, Sunday: A spooked Ashville rallies: Portland 34.5%, Asheville 38.3%. Final Update, 9:09 am, Monday: the poll is closed, and Asheville has run up the score, 39.9% to Portland's 34.1%. Each beer was tasted by a rotating subset of the larger tasting panel. At each tasting, we had a steward who was responsible for selecting beers for each of the evening's panel of three to six tasters.... Beers were grouped with other beers of the same family--and the same style when possible--and served in flights of three, six, or (occasionally) nine beers. 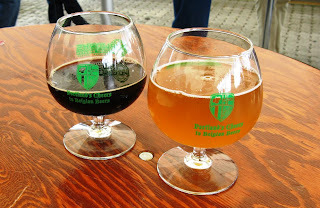 Though the beers were roughly grouped by style, we did not know anything about them (including the style). They were poured in another room and brought out on trays and were numbered. We had a form and a space to write comments for each beer. We also rated them numerically in categories ranging from hoppiness to mouthfeel to bitterness. No table talk until everyone was done writing. The goal was pretty obvious: separated from their label, fame, and our memory of them, how would these beers stack up when tasted blindly? The results of the tasting "trials" form the main substance of the book. Let's start with what worked, first. 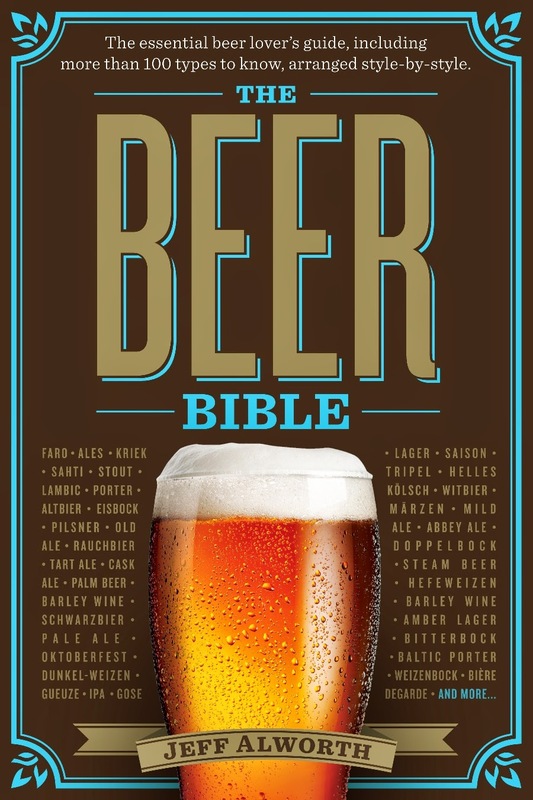 The book includes ratings for 250 beers (which, since most of them came from Belmont Station, are available in Portland! ), and they're rated within categories. I generally find the scores credible, and therefore surprising. The panels gave Rodenbach a 7 and Rodenbach Grand Cru a 9. Good! 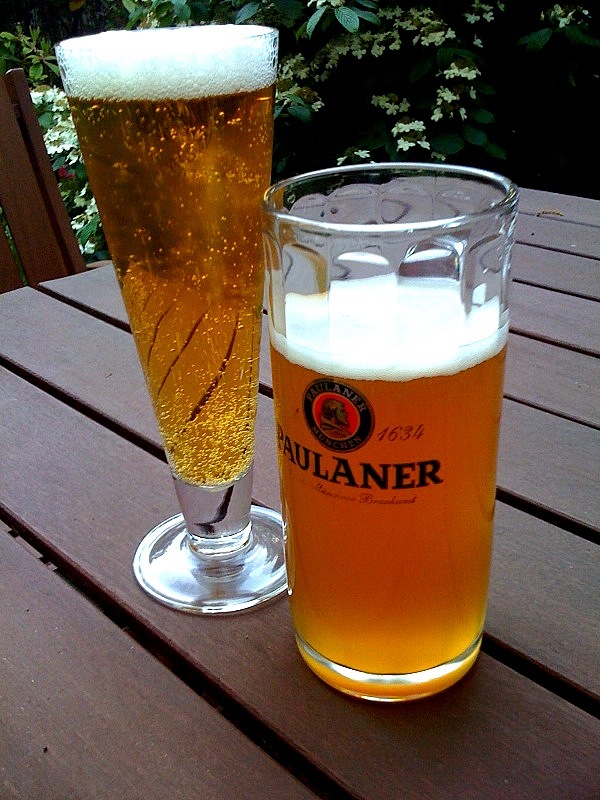 A number of world classics received their highest score: Saison Dupont, Paulaner Hefe-Weizen, Pliny the Elder. A number of well-regarded beers got middling scores (Full Sail Pale, Widmer Hefeweizen, Rochefort 8) while some poorly-regarded or lower-profile beers scored highly (Singha, 7)--exactly what you expect in a blind tasting. Broken Halo was awarded the highest score in the IPA category, which given its competitiveness, was an eyebrow raiser. To the extent you can find overlooked-beers that scored well, it's quite handy. Now to what didn't work. One big problem are the ratings, which aren't scaled. So while you read in the front matter that it's a ten-point scale, it's really only seven, with no beer getting a 1, 2, or 10. Worse, the median score is a 7, meaning that half the sample is bunched up at the top end (but not very top!). I would really have liked to see a weighted sample that did spread out over the full scale. Even better, it would have been nice to see the weighting applied to each "family" of beers (the book doesn't divide them up by style), so you don't end up with the problem they faced in the pale ale category, where the highest score was an 8, and where 28 of the 44 beers gets a seven or eight rating. Another problem is the pale lager category, which contains everything from Czechvar and Prima Pils to Pabst and Keystone light. It's the largest category, with 81 entries--most of them industrial lagers. While there's something vaguely interesting in seeing Pabst (6) beat out Miller High Life (5) and Bud (4), it hardly bears giving each of these beers a one-page treatment. And when you devote 81 of your 250 slots to crap beer, that leaves fewer slots for the beer we really care about. Finally, there is the age-old problem of rating beers within categories. While it's true that Pabst may well be a "6" in terms of light lager, how are we supposed to compare it to other sixes like Lindemans Framboise, Full Sail Pale, or Samuel Smith's Oatmeal Stout? The casual reader may not know. And this is really where I begin to wonder: who's the audience for this book? The Wine Trials made a lot of sense. When you stand in front of a wall of wines at the grocery store, you see some for $8, some for $25, and some for $60. These prices may not reflect actual quality--a well-regarded vintner may have had an off-year, while an obscure Chilean vintner had a stellar one. Unless you drink a huge amount of wine, you can't know which vintages and wineries to choose. Beer is different. If you've had a sixer of Deschutes Mirror Pond (Beer Trials rating: 7), you know what it tastes like. You don't have to wonder if it still tastes the same. And even if you're standing there looking at a beer you haven't tried, say Boddington's Cream Ale (Beer Trials rating: 4), you figure that at three bucks a can, you're not really out anything if you try it. And is anyone standing there in front of the 36-packs of Icehouse thinking, "Gee, I wonder what this got in Beer Trials?" 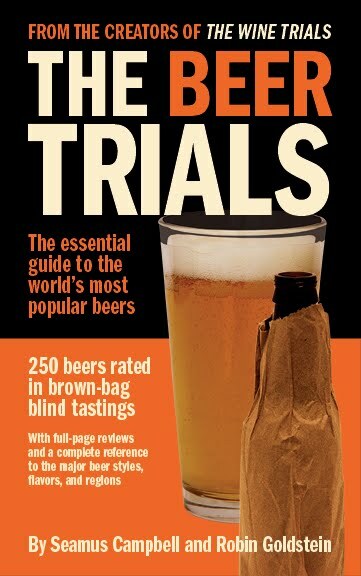 I hope the book sells, because I hope all beer books sell. I would like to write a few, and it would be cool to see a robust market developing. But I'm not sure who will pick up this book and decide they need it in their collection. It's a worthy experiment, but the execution strikes me as having a few beta-version bugs. My suggestions: weight the beers, ditch the macros, and expand the whole selection to include a thousand beers or more. That's a book I want. I'll be interested to see if that Double Mountain is as well received in Seattle as it was by me. And now for some indefensible homer boosterism: go Oregon! Primary election night and the mayor of Portland is exhorting his neighbors to vote BeerCity USA in an online poll? See, Asheville, that's why they call us Beervana. 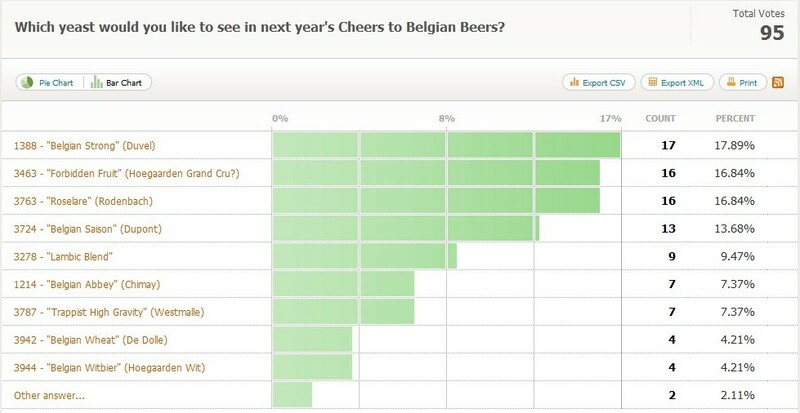 Last year, Charlie Papazian hosted an online poll to crown "BeerCity USA." The poll was almost as silly as cramming together the words "beer" and "city," but we Portland bloggers gamely played along. (With one prescient, notable exception.) In the end, Portland won, but Papazian violated his own rules and declared us joint winners with Asheville, North Carolina. Charlie's doing it again this year (though mercifully, the poll is only open a week, not months like last year). And again the only two cities who are competing are Portland and Asheville. Personally, I find the whole business unseemly. I say let Asheville (where the poll has made the local news) run away with it. Who cares? Better yet, vote for a different city altogether, one deserving of the attention. This year I voted for San Francisco, mainly because Jay Brooks seems genuinely disappointed that no one there is voting for his fair city. Lord knows it's a better choice than Asheville. Portlanders, let's be dignified this year. We can watch it with amusement from one of our 33 breweries. Sit it out. And go San Fran! 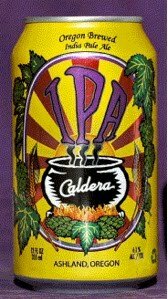 Latest in my line-up of IPAs is newly-released Gubna from Oskar Blues. (Don't get the joke? Say it with an English accent.) My neighbor-across-the-street gifted me a can, which I discovered on my porch a couple weeks ago. Perhaps he knew I was doing a series on IPAs. So, guv, how does this Colorado brew stand up? 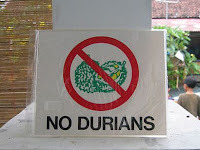 Let us start with a fruit known as the durian. Those of you who have traveled in Asia may have encountered it--or laws that ban it. Durians have a stronger smell than any fruit on earth, and it is complex, driving some to dances of ecstasy and others to the nearest exit. Among the flavor compounds are esters and ketones, which brewing geeks will recognize from their hop lessons, and they emit aromas that vary from onion to turpentine and cheese to skunk. Why am I bothering to invoke the chemistry of this obscure Asian fruit? Because Gubna uses 100 IBUs of Summit hops (and only Summits), and I'm still having flashbacks of the time Sally and I tried to get a durian from Hilo to Kona in the trunk of our rental car. This beer is undrinkable. It is foul. It is nasty. I try to sneak up for a sip and recoil from the barest hint of the wafting aroma. To my nose, it is a concentrated essence of onion and chive, as if you accidentally opened an industrial vat of Lays Sour Cream and Onion powder--or stumbled across a durian. I could literally consume only two sips of this before it repelled me from getting within six inches of the glass. Okay, eighteen. Of course, the human nose does not perceive things uniformly, and not everyone has this reaction to Summits. If you read through the entry at BeerAdvocate, only one in ten readers even mentions it--and it's getting a B overall. Others go on and on about grapefruit rinds. Which, to my nose, is like talking about the other fruit sitting next to a durian--it may be there, but how would you know? I guess if you can't smell the onions, it's a pretty sweet beer. Almost never do I dump an entire beer. This one not only went down the drain, but I flushed it with water and waved around a cross while praying for complete exorcism. In sum: I hated Gubna; you should definitely try it. As businesses go, breweries are a good barometer. They require a balancing act that brings together imported ingredients (in the case of Middle Eastern breweries), distribution lines, and customers. Cohen makes a good case that the survival of Taybeh is a useful canary for the Palestinian coal mine. To riff on this for a moment, Taybeh's example could be a metaphor for the history of brewing. One of the most important factors in shaping the development of styles is international politics. Trade relations can facilitate growth and bring in ingredients from around the world. The prevalence of orange peels in Belgian brewing attests to this. But bad trade relations can also cripple local breweries. Wars, too, exert their influence. Until the First World War, British beers were quite strong. Two World Wars and many grain rations later, they were far weaker--never to return to former levels. 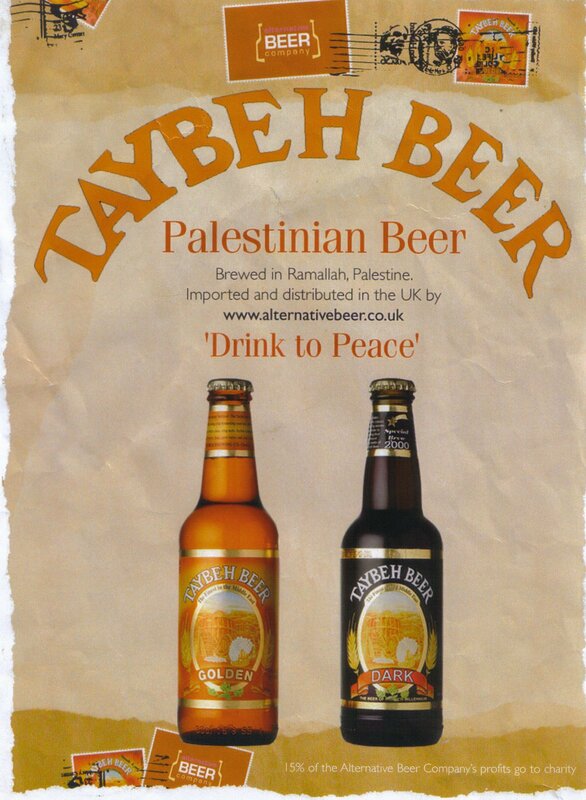 Taybeh is one brewery, and isn't the strongest indicator. Still, if it can find a healthy local market and thrive, it says something about the country that's supporting it. Some of you may have noticed that the site looks slightly different. I've been converting it to a more modern set of codes offered by Blogger. It shouldn't change functionality much, but some of the cosmetic changes were unavoidable. It will allow me greater flexibility to do things like adding this sweet Retweet feature you see in the upper-right hand corner of the post. It's still in progress, so bear with me. This is one of those thoughts that passed through my mind as I poured out the latest tinned offering, Pyramid Hefeweizen, which the brewery thoughtfully sent to me last week. Bottles can be ugly, but they are not innately so. The lines of the standard bottle are pleasing, and label art has the ability to instantly attract the eye. Bottles can be shaped to suit a brewery, with long, elegant necks like Pacifico sports, or short, squat bodies as in Session Lager. They may be embossed with logos or come in different colors. Cans, on the other hand, are purely industrial and come in one shape. Metal, though it does occur naturally, has the least natural feel of any material. Its cold, impersonal color is impossible to conceal. The colors seem to wash out on aluminum and often the printing isn't exact. No m atter how they're designed, there's always a segment of the can that has small print, which further erodes any elegance a designer may try to impose. No matter how clever the design, a can looks industrial and communicates chemistry, not art. And finally, no matter how hard I try, I cannot look at a can of beer and not see a halo of all the cheap beers of my past. This is a cultural artifact and may well diminish for future generation. For graybeards, though, the brain has to do a stutter step every time the eyes take in a canned craft beer. We have reified the can, freighting it with the meaning and emotion of "cheap" and "gross." Our old creaky software must find the patch which clarifies matters: "nope, the Caldera's good," we remind ourselves. Canning is good and I'll get behind it. But I'm never going to come around to think the can is an attractive package. I got the call that my father had been in a bad accident sometime around noon on Sunday. In the next few hours, Sally and I made arrangements to travel to Boise that evening, and we ate in the Laurelwood Brewpub in Concourse A at PDX on our way out of town. I enjoyed a fine IPA, which helped dull some of the anxiety that was rising in me. Dad, it turns out, will probably be fine. There are a few asterisks and caveats, but it may well be that by August, he'll be roughly where he was a week ago. Last night, I had my second beer of the trip, in the lobby bar of the Doubletree Riverside. (In what I consider a short-sighted gesture, the hospital cafeteria failed to offer beer.) It followed four grueling days of watching dad in the ICU, and man, was I ready for a frosty one. The Doubletree had four beers on tap: Fat Tire, Bud, Bud Light, and my choice, locally-brewed Table Rock WhiteBird Wheat. It was the same color and clarity as the Bud, and not much more interesting--very dry, and mildly wheaty, once I got the glass warmed up. Taking the phrase too literally, Boise's the kind of place where they serve you ice cold beer in a frosty glass. Ah well. When Cleveland collapsed in the fourth quarter, I decided to forgo a second. It's great to be back. Boise, city of my birth and first fifteen years, has certain charms I suppose, but they're lost on me. Tonight I'll find a real beer. I'm not in a position to pull this off (though I'd like to), but do you guys think a "cask-only" or at least "cask-focused" pub could survive in this town? Say 5-10 beer engines and a firkin or two on the bar? One thing that is a big benefit is social media. Long before you opened the doors, I think you could be banging the drum on Twitter and Facebook to get people excited. You could do a launch with a slate of cask beers you've pre-arranged with breweries so that for the first month or so you always had something new and fresh to promote. With Brewers Union and Block 15, you'd have some solid supply-side support. I know others would be willing to join the party if there was a market there--like Mac's, for example. I was trying to figure out a way to make a joke about hung over and hung parliament based on the results of the British elections and their polling places, depicted below. I couldn't, so I'll just show the picture. So this is the scene. Last night, MacTarnahan's had a release part for Lip Stinger, their peppered saison, which is making a surprising return in 2010. (With exotic beers it's usually one and done, so kudos to Mac's for sticking with it.) But what really interested me was a far less ballyhooed feature of the party--a cask of MacTarnahan's. Very quietly, brewer Vasilios Gletsos has been experimenting with the notion of cask ales, tapping one on special occasions. Mainly, it happens, when I'm not around. Last night was typical; I already had plans and couldn't make the event. (Though I think the ubiquitous Angelo De Ieso, w hom I've started to think of as the beer gypsy, did make it--so maybe you'll hear more.) Amazingly, Mac's Mark Carver poured out a growler and dropped it off at the house last night. The whole thing had a kind of metaphoric quality. 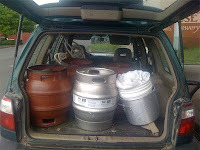 Over the past year, I have been spending a lot of time thinking about cask ales. 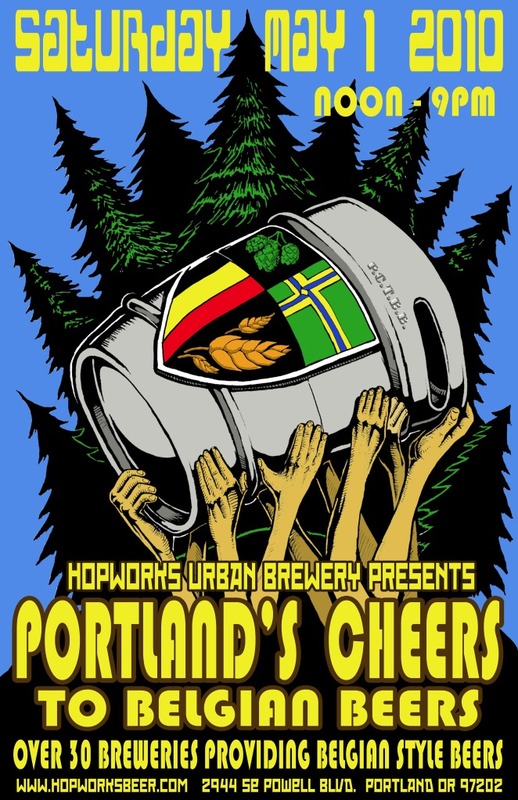 My love of them blinded me to certain realities which have only recently become obvious: even in beer-crazy Portland, real ale commands the devotion of only a tiny group of fans. I have no idea why. To me, nothing draws the flavor of hops out like cask conditioning. I'm always frustrated by the near-freezing temperatures at which pubs have to serve regular draft; a 55-degree cask ale allows flavors and aromas to blossom. Even the "flat" quality is far silkier than the more-carbonated regular drafts. All of this makes me think more people should like cask. But no. Those of us who do seem more like an underground society--dissidents who must secretly pass along critical data via oblique signal. I imagine developing a code--tap of the left temple with an index finger--and then whispering obscure messages: "The crow caws at Bailey's--Caldera pale." Last night had the feel of subterfuge. Mark and I were communicating via cell phone; he made the drop literally in the dark of night. Carver's last missive: "Delivered." I touch my temple in response, "Da, comrade." Mac's is, of course, the perfect cask ale. Vasili was right to identify it as such and hatch this scheme. I expected it would be, but you never know--cask is a fickle mistress. Sometimes beers that should billow with flavor fall flat. Others that seem clearly unfit somehow become transmuted to rare elixirs. Mac's though, delivers. I've been drinking beers from the brewery for 20 years, and one consistent feature is that they are highly filtered, very clean beers. So seeing Mac's in its unfiltered, hazy glory was a little shocking (that picture above was taken last night at about ten). It has every bit of the silky texture a cask ale should have, but the hops are the big attraction. It's made solely with Cascades, and they express a lot more character than one is used to. I found a peppery pine note that is usually concealed, and overall they were greener, less citrusy. Mac's is dry-hopped, so the nose is wonderfully fragrant. If this beer were available on cask regularly, it would be one of my go-to tipples. Sadly, the cask is probably already gone. Vasili is spooked by the idea that they'll start to turn, so he won't leave one on much more than an evening. This is the other problem with real ale--it doesn't last. Most pubs around town rotate their cask beers, so you can never find a one that's on all the time; this is both good and bad, but it does tend to accentuate the whole secret society thing. Last night I tweeted about Mac's--the 21st Century version of a dissident's whisper--and those who saw it had their chance. Now we wait for the next missive. The few, the secretive, lying in wait for a good pint of real ale. Draft Magazine does a regular feature called "On the Beer Blogger Beat," wherein they pose four questions to a blogger. They've spoken to Lew Bryson and the Beer Wench in past editions. Today it's me. I won't repost it here--I think the idea is that they want to drive some traffic. But I'll offer a teaser: go have a look at how I managed to not-quite-answer three of the four questions! I should have mentioned that I also blog politics from time to time--that might help explain things. La Ferme’ de Demons has been re-barreled, less the Oregon Oak and dosed with Brett. I anticipate that in about 3-4 months the character of the Brett will meld with the barrel notes and accentuate some cherry pie love. Will this bridge the gap between opinions? Only time will tell. Look for La Ferme de Demon’s on tap here and one or two select Portland taprooms in October…and in limited 750ml corked bottles! As the winner of Peoples Choice award I get to select the yeast strain for next year’s competition. Yes, my vote would be for some Brett or the Roeselare blend, but I don’t believe all breweries are set up to tame the wild. As I travel to Belgium next week I will look into the possibility of Wyeast being able to supply special yeast that I will be able to sample on location. I will work with the organizers quickly and encourage a timely dart throw to give our great Oregon breweries ample design and conditioning time. Today we pit an under-appreciated West Coast IPA versus a famous East Coast counterpart. This set-up no doubt tips my hand, but here we go. This is a pretty famous beer. This may be a result of the label, one I would put in the top ten for American beers. You can't look at that label and not feel your hand reaching, as if ... possessed. I have had periodic bottles and been unimpressed, but it was time to give this east coast bigwig another shot. It's a surprisingly dark beer, well into the amber realm, nudging its way toward brown. All well and good. The aroma is resinous and foresty--some day I'll make a study of tree scents so I can speak accurately about the way beers smell. I'm calling this one Noble Fir. The East Coast seems to be characterized by cleaner hopping. On the west coast, we go for funk--tangy, fuzzy, green (see below) funk. HopDevil has more of a clean, British hop nose. The big problem I have is with the malt bill, which gives a harsh, tannic note. The hopping isn't especially strident, but when combined with this, the result is somewhat punishing tipple. But such a cool label! Call it a gentleman's B-. Bear Republic's familiar IPA wasn't the first one I thought of. Sifting through various California offerings, I found myself nonplussed by AleSmith, which I've never had (and failed to take notes on). (Jeez, two sentence-ending prepositions--dicey business.) I also confirmed my lack of enthusiasm for Stone and Lagunitas. Green Flash turned out to be too much of a double IPA (though nicely done), and so here came Racer 5. 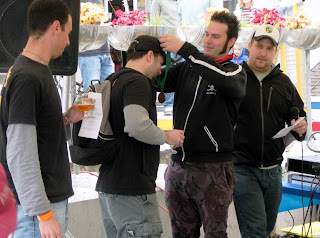 I recalled it pretty fondly in my memory, and was surprised to find that it had one two gold and two silver medals at the GABF. It, too, is right on the edge for a standard-issue IPA: 7%, with "75+" IBUs. I've been making my judgment based on presentation, and tasting this, it actually behaves like a standard IPA. It looks like we now think IPAs should: hazy golden, with a diffident head that vanished after little fight. The aroma is both familiar but also impressive: loads of piquant citrus, a decent alcohol plume, and something that smells a lot like what I would imagine ganja smells like--if, you know, I'd ever smelled it. That note rises with the temperature. The flavor is similarly familiar but unique. It's actually a pretty sweet beer, with apricot fruitiness that gets drawn out by the hops (four Cs: Chinook, Columbus, Cascade, Centennial). There's a darker, pine tar bitterness that seems to have some connection to the ganja nose, plus lots of grapefruit. It's quite a distinctive IPA, and my appreciation grew throughout. Houston, we have a winner. Call it a very solid A-, with the likelihood that it's an A being thwarted my my fear of grade inflation. Okay, one more from my IPA project. (Still secret!) Today we travel to Norway for Nøgne Ø's huge, 7.5% IPA. Pours out a viscous, dare I say gloppy, amber, heavy with chunky lees. The aroma is nice--caramel and toast, but not a huge hop presence. (When a beer travels half way around the world, you can't complain too much if the subtler hop aromas aren't as intense as they would be at the brewery.) Alcohol vents in waves. I've never been to Scandinavia, and as far as I know, it is a gentle pocket of strangely glorious warmth, a place wherein all the citizens have conspired to promote it as an arctic wasteland to keep out the interlopers. But thinking as I do that it is an arctic wasteland, I am comforted to find a body of such heft and muscle that Sally handed me her half of the beer with an "Uggh." Ha, no Viking are you! Given that it's a 7.5% beer, the purported 60 BUs of hopping seem awfully pronounced to me. They wish to push me around and grow hair on my chest. Resinous, maybe a wee harsh and sharp (Cascades and Chinook), but they somehow go with the thick malt, which is more viscous than creamy. A bit of plum to boot. It's a robust but homey beer--rustic. 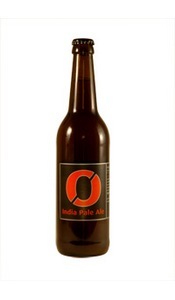 The fellows who started Nøgne Ø take pride at having brought IPAs to Norway, and I expect the Norwegians thank them. An IPA like this is burly enough to stand up to a stiff wind howling across the ice floes. I hope that they point out, however, that their version comes straight from America's West Coast, where we have been using the same ales to temper our more modest rainy winters. Call it a solid B--strong but not super subtle. Hey Everyone, let's have a poll! Let the wild speculation/lobbying begin. Perhaps you've seen the empty ad space to the immediate left of this sentence. That's the sign that my first advertiser's three-month run has ended. If you're at all interested in advertising on this blog, click through and see how easy it is. I run the ads through BlogAds, which has a nice interface that makes it easy to put up the content you wish. It's cheap and you can run an ad for just a week or months--your choice. If you're interested in seeing my stats, holler, and I'll send them along. It's all in the yeast. 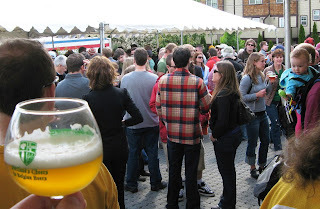 This was the fourth year of Portland's Cheers to Belgian beers, a fest in which participating breweries all work with a single yeast strain and brew recipes of their own choosing. I missed the first year, when breweries used the versatile Rochefort strain (which Double Mountain also uses). 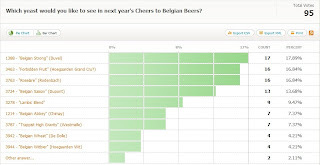 The last two years, though, with the Ardennes (La Chouffe) and Ingelmunster (Kasteel), were largely misfires. Those yeasts were finicky and tended to produce heavy, cloying beers. I've no doubt that given time, breweries could have made some great beers, but the beers at those fests weren't especially distinctive. This year's strain was a saison from Blaugies, both easy to work with and versatile. The beers? Far better than the past two years. General comments. Although all the breweries used the saison yeast in primary, at least five went a step further and soured their beers with wild yeasts or bacteria. Two used sour mashes. On the one hand, you could argue this undermines the fest's purpose--everyone's supposed to use the same yeast. On the other, it shows that breweries are taking the yeast as a jumping-off point. They're developing beers that express the styles they want to brew. I heartily endorse this experimentation. As for the yeast, while it was versatile, it didn't seem to take to dark beers as well as light--at least when no souring was involved. Maybe someone smarter than me can explain that--or maybe it was just coincidence. Sally and I tag-teamed, managing to sample at least half-pours of 17 beers. 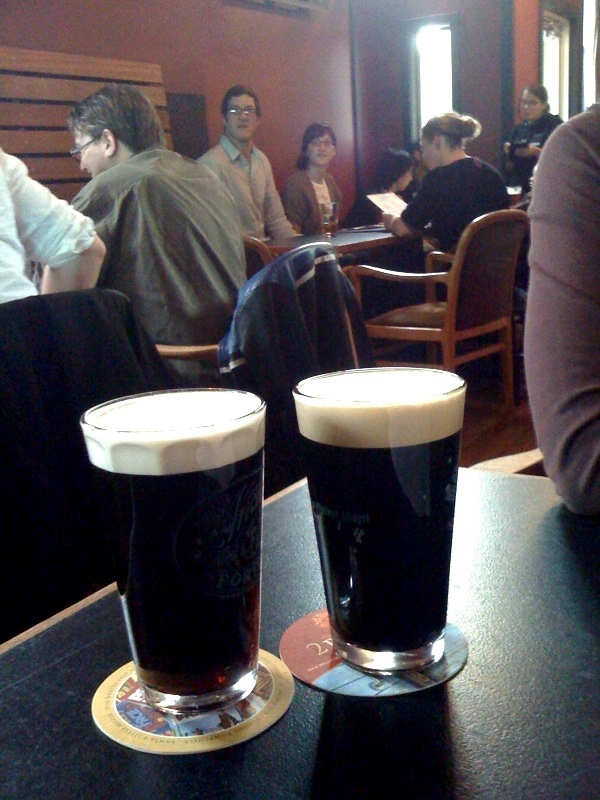 (We both liked two beers well enough to get second pours, and I gave my last ticket to Bill.) Of those 17, I tried only one beer I'd call a dud. Four were absolutely fantastic. The rest fell in the mid-range. Looking around at some of the early reviews, and based on talking with folks at the fest, I'd say this was similar to others' experience--though the beers we admired differed. Liking different beers--there's a lesson in that. 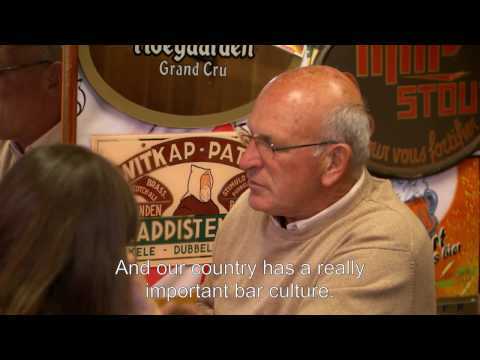 Belgian breweries tend to take beers further down roads than breweries in other countries; Belgian beers are often sharp-elbowed and challenging. 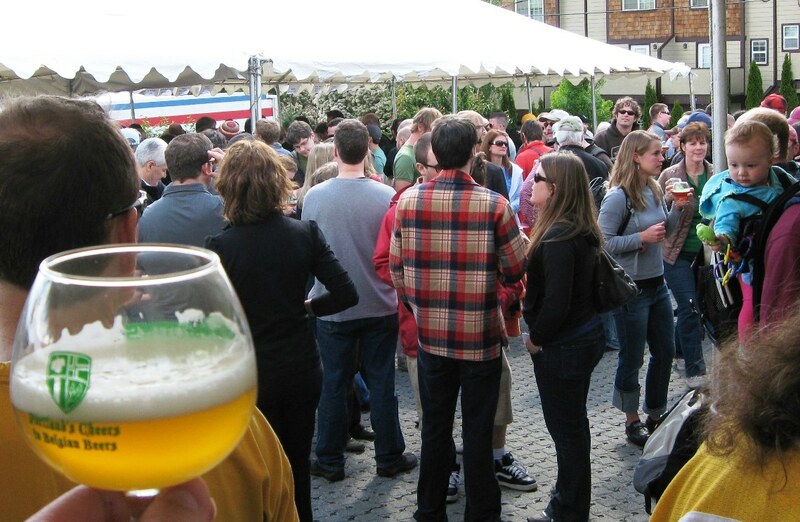 Even among those known as great beers, a minority of people will just flat-out dislike them. That we all appreciated different beers at this fest attests to the breweries' success in really exploring style and ingredients. Take Oakshire, for example. It was a strong beer with four spices and a bold palate. When I spoke to people at the fest, they either liked it or disliked it. But interestingly, we all pretty much described it the same way. The spices were well-integrated, drawing out flavors that might have been fermentation characteristics (probably excepting the the grains of paradise). I think there were some fusel alcohols, to which my palate is especially sensitive, and so I found it harsh. But both Doc Wort and Derek gave it high marks. That's the nature of this fest--different strokes. The beers I admired got panned by others. So, with that in mind, here are my reviews. I'll follow both Doc and Derek's lead--I'll go alphabetically (like Doc) and offer letter grades (like Derek). The four I liked all got As or A-minuses. Roots Brune O. The second-to-last beer, and one which I couldn't really taste properly. It seemed in possession of that stale sourness, but not overwhelmingly. There was some spiciness, and maybe some dark fruit, but my tongue couldn't do it justice. Rating: C+, with a big caveat for rater unreliability. I gave four beers As, something I try not to do too often. But I don't think it's grade inflation either (a charge leveled at me in the past)--the average of all the other beers is a B-. These four are the kinds of beers I would be happy to drink every day; the kinds of beers that leap into your mind when you're in the mood for a particular style. I didn't just admire them, I liked them. I don't expect Big Horse or Upright to replicate these beers, but consider this my official appeal to Widmer and Rock Bottom to consider doing an encore. Update. Bill and Angelo have added their reviews. Update 2. We have a winner: Block 15 La Fermé de Demons. They will have the right to select the yeast for next year's fest. Generally the winner gets to host, but apparently PDX retains the right, so I'm not sure who will host in Block 15's stead. The top six vote-getters speak well for the crowd, too: Cascade Brewing's Frite Galois, Green Dragon's King Ghidorah, Hopworks' DiaBlato, Oakshire's La Ferme, and Upright's Mingus and Monk. Congrats all around. As I look back at that list, I notice soemthing interesting. Every one of the breweries in the top six except Cascade was established in the last three or four years. In other words, the kids are all right. were absurdly early. Not so. 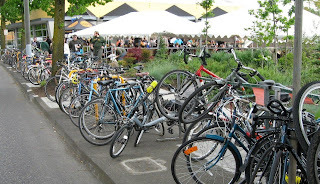 An homage to Hopworks' bike ethos? 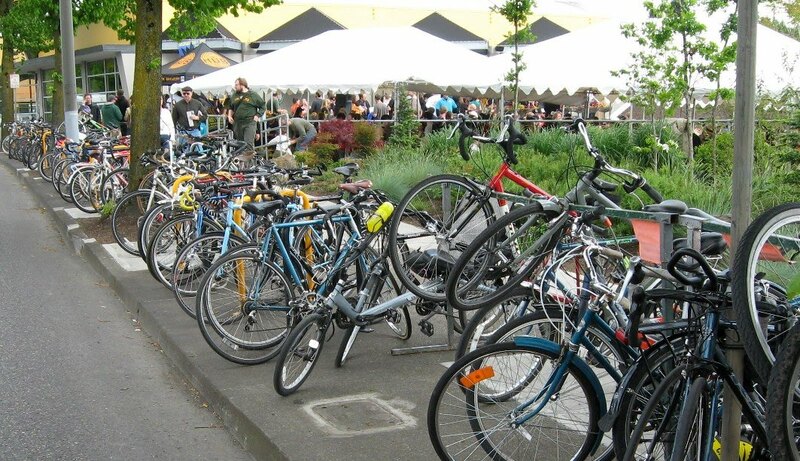 Lots came to the fest on two wheels. announce winners of the homebrew contest.